"Stephen Goss is a concert guitarist, a composer of distinction, an academic and an arranger capable of brilliance. His treatment of some of Satie's Gnossiennes and Gymnopedies emphasised the precise, clean writing: shared out equally among the four guitars, it made a profound impression, Gnossienne No.2 in particular weaving a spell almost disturbing in its intensity." 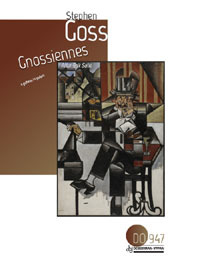 Goss’s interplay with Satie takes more than one form. The two Gymnopedies are heard in fairly straightforward arrangements, via Debussy’s orchestrations of the originals. The three Gnossiennes, on the other hand, are more subtly reworked, beautifully reconceived and developed in terms of this particular instrumentation. Stephen Goss’s work as a composer is by no means limited to pieces for his own instrument, the guitar (or multiples thereof) – bearing in mind such pieces as, say, his Garden of Cosmic Speculation (2005) for bass clarinet, violin, cello and piano – but his intimate knowledge of the instrument is certainly central to the sheer quality of these works.